Mecklenburg County is a county located in the U.S. state of North Carolina. The population of Mecklenburg County is 919,628 people (as of the 2010 census), making it the most populous county in North Carolina. Its county seat and largest city is Charlotte. Mecklenburg County was formed in 1762 from the western part of Anson County. It was named for the German state of Mecklenburg-Strelitz. In 1768 the part of Mecklenburg County west of the Catawba River became Tryon County. The Mecklenburg Declaration of Independence was allegedly signed on May 20, 1775; if the document is indeed genuine, Mecklenburg County was the first part of the Thirteen Colonies to declare independence from Great Britain. In 1792 the northeastern part of Mecklenburg County became Cabarrus County. Finally, in 1842 the southeastern part of Mecklenburg County was combined with the western part of Anson County to become Union County. According to the U.S. Census Bureau, the county has a total area of 546 square miles (1,415 km²), of which, 526 square miles (1,363 km²) of it is land and 20 square miles (52 km²) of it (3.65%) is water. Mecklenburg County contains seven municipalities including the City of Charlotte and the towns of Cornelius, Davidson, and Huntersville (north of Charlotte); and the towns of Matthews, Mint Hill, and Pineville (south and southeast of Charlotte). A small portion of the town of Stallings is also in Mecklenburg County, though most of it is in Union County. Extraterritorial jurisdictions within the county are annexed by municipalities as soon as they reach sufficient concentrations. The county's primary commercial aviation airport is Charlotte Douglas International Airport in Charlotte. With twenty-five freight trains a day, Mecklenburg is a freight railroad transportation center, largely due to its place on the NS main line between Washington and Atlanta and the large volumes of freight moving in and out of the county via truck. Mecklenburg County is served daily by three Amtrak routes. The Crescent train connects Charlotte with New York, Philadelphia, Baltimore, Washington, Charlottesville, and Greensboro to the north, and Atlanta, Birmingham and New Orleans to the south. The Carolinian train connects Charlotte with New York, Philadelphia, Baltimore, Washington, Richmond, Raleigh, Durham and Greensboro. The Piedmont train connects Charlotte with Raleigh, Durham and Greensboro. The Amtrak station is located at 1914 North Tryon Street. A new centralized multimodial train station, Gateway Station, has been planned. It is expected to house the future LYNX Purple Line, the new Greyhound bus station, and the Crescent line that passes through Uptown Charlotte. Mecklenburg County is also the proposed southern terminus for the initial segment of the Southeast High Speed Rail Corridor operating between Charlotte and Washington, D.C. Currently in conceptual design, the SEHSR would eventually run from Washington, D.C. to Macon, Georgia. Light rail service in Mecklenburg County is provided by LYNX Rapid Transit Services. Currently a 9.6-mile (15.4 km) line running from Uptown to Pineville, build-out is expected to be complete by 2034. Charlotte Area Transit System (CATS) bus service serves all of Mecklenburg County, including Charlotte, and the municipalities of Davidson, Huntersville, Cornelius, Matthews, Pineville, and Mint Hill. The vintage Charlotte Trolley also operates in partnership with CATS. Mecklenburg's manufacturing base, its central location on the Eastern Seaboard and the intersection of two major interstates in the county have made it a hub for the trucking industry. Data represents Jan 1990 to Nov 2009. An eighth Fortune 500 company, Wachovia, will retain its headquarters in Mecklenburg while its acquisition by Wells Fargo for $15.1 billion in stock is being completed. The Federal Reserve approved the merger on October 12, 2008. Mecklenburg County's largest employer is Carolinas Healthcare System, with 26,283 employees, followed closely by Wachovia (20,000) and Bank of America (13,960). 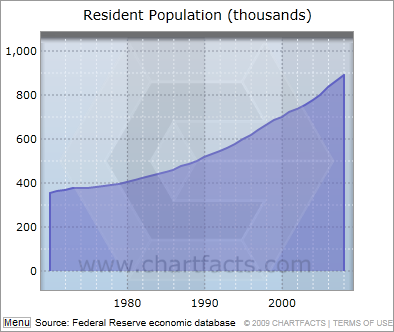 Population grew 2.5% per year from 1970 to 2008. As of the census of 2000, there were 695,454 people, 273,416 households, and 174,986 families residing in the county. The population density was 1,322 people per square mile (510/km²). There were 292,780 housing units at an average density of 556 per square mile (215/km²). The racial makeup of the county was 64.02% White, 27.87% Black or African American, 0.35% Native American, 3.15% Asian, 0.05% Pacific Islander, 3.01% from other races, and 1.55% from two or more races. 6.45% of the population were Hispanic or Latino of any race . There were 273,416 households out of which 32.10% had children under the age of 18 living with them, 47.70% were married couples living together, 12.40% had a female householder with no husband present, and 36.00% were non-families. 27.60% of all households were made up of individuals and 5.90% had someone living alone who was 65 years of age or older. The average household size was 2.49 and the average family size was 3.06. In the county the population was spread out with 25.10% under the age of 18, 9.70% from 18 to 24, 36.40% from 25 to 44, 20.30% from 45 to 64, and 8.60% who were 65 years of age or older. The median age was 33 years. For every 100 females there were 96.50 males. For every 100 females age 18 and over, there were 93.60 males. The median income for a household in the county was $50,579, and the median income for a family was $60,608. Males had a median income of $40,934 versus $30,100 for females. The per capita income for the county was $27,352. About 6.60% of families and 9.20% of the population were below the poverty line, including 11.50% of those under age 18 and 9.30% of those age 65 or over. Mecklenburg County is a member of the regional Centralina Council of Governments. The County has two governing bodies: the Mecklenburg Board of County Commissioners (BOCC), and the Charlotte-Mecklenburg Board of Education. Both are nine member boards, with six district representatives and three representatives elected at-large by the entire county. The current chairman of the Mecklenburg BOCC is Jennifer Roberts. The residents of Mecklenburg County are provided emergency medical service by MEDIC, the Mecklenburg EMS Agency. Mecklenburg County went for Barack Obama in the 2008 United States Presidential Election by 61.8% to John McCain's 37.4%. One common school district, Charlotte-Mecklenburg Schools (CMS), serves the entire county. The Public Library of Charlotte and Mecklenburg County serves residents of Mecklenburg County. Library cards from any branch can be used at all 20 locations. The library has an extensive collection (over 1.5 million items) of reference and popular materials including DVDs, Books on CD, best sellers, downloadable media, and books. The Billy Graham Library contains the papers and memorabilia related to the career of the well-known 20th century evangelist, Billy Graham. Brigadier General William Lee Davidson,(1746–1781), was a North Carolina militia general during the American Revolutionary War. Billy Graham, (born 1918), world-famous evangelist who has led religious revivals in many nations around the world. He has also served as a spiritual advisor to many U.S. Presidents. James K. Polk, (1795–1849), 11th President of the United States. Polk was born in Mecklenburg County in 1795; his family moved to Tennessee when he was an adolescent. ^ "FRB: Press Release--Approval of proposal by Wells Fargo & Company to acquire Wachovia Corporation". Federal Reserve Board. 2008-10-12. http://www.federalreserve.gov/newsevents/press/orders/20081012a.htm. Retrieved 2008-10-12. ^ "Largest Employers". Charlotte Chamber Web Site. http://www.charlottechamber.com/index.php?submenu=largest_employ_members&src=gendocs&link=LargestEmployers&category=Research. Retrieved 2008-10-21. This page uses content from the English language Wikipedia. The original content was at Mecklenburg County, North Carolina. The list of authors can be seen in the page history. As with this Familypedia wiki, the content of Wikipedia is available under the Creative Commons License.